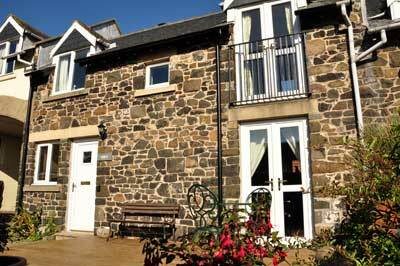 Aidan Cottage is a modern cottage built with the original whinstone of the village. It is south facing and situated a short distance from the harbour, in a very quiet, private area of Craster, but only a hundred metres from the village pub and shop. The interior is cosy and relaxing with a modern kitchen opening to a small dining area and a lounge which has patio doors leading to a decking area in the walled garden. Upstairs, there are two double bedrooms and one bathroom. The master bedroom has a Juliet balcony with patio doors overlooking the garden. The whole cottage has night store heating. There is an off the road, demarcated parking area for your car at the end of the terrace.